Japan occupies the Solomon Islands, interfering with Allied supply lines in the South Pacific. In a surprise attack, the Americans capture Guadalcanal and its invaluable airstrip. As the Imperial Navy struggles to regain and strengthen its hold on the Solomons, the U.S. must press its counterattack in order to seize control of the island chain. Axis & Allies Guadalcanal challenges you to command a fleet of ships, direct aircraft, and deploy ground forces in order to dominate the enemy in one of the crucial campaigns of World War II. The game includes a total of 172 detailed miniature naval, air, and land units. Axis & Allies Guadalcanal is designed for two players and can be played in two to three hours. Axis & Allies Guadalcanal is the fifth Axis & Allies variant, following the successful Axis & Allies D-Day, Axis & Allies Europe, Axis & Allies Pacific and Axis & Allies Battle of the Bulge versions. 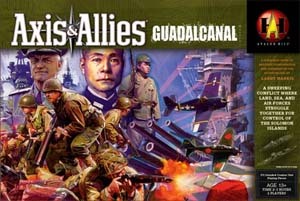 Axis & Allies Guadalcanal is available on November 16th, 2007.